The area of Roselle began to see American settlers in the 1830’s, when the United States Government was offering land for just $1.25 per acre. In 1837 Deacon Elijah Hough, his wife, daughter Cornelia and sons Oramel and Rosell settled in the Bloomingdale area. Rosell grew up and moved to Chicago and returned to the area at the age of 48. By the time Rosell Hough had returned the area was predominately farm land producing flax and corn. Hough opened the Illinois Linen Company and became the president of the Chicago and Pacific Railroad Company. Rumors say the Rosell used his position at the Railroad Company and his wealth to alter a land survey to have it show that a new railroad line should be built through Roselle. The train schedule made a printing error and printed the name of the new town with an e at the end giving Roselle its current name. Today Roselle has a station on Metra’s Milwaukee District/West Line providing daily service between Elgin and Chicago Union Station. 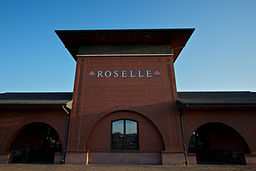 Roselle has four main commercial areas, one on the southern border along Lake Street, one in the village center near the historical area of Park Street and one just north of the town center at Main Street Station along the Soo Line Railroad and a fourth on the northern end along Nerge Road. Many of the residents who live in Roselle commute to work at larger companies in nearby Chicago and neighboring suburbs such as Schaumburg. The schools of Roselle are split up among seven different school districts. Roselle School District 12 is the only district located entirely inside Roselle with two schools Spring Hills Elementary and Roselle Middle School. Lake Park High School District 108 has offices and both campuses located in Roselle and services Roselle and many neighboring areas. The northern area of Roselle is served by Schaumburg Township High School District 211. Other areas of Roselle are serviced by Keeneyville School District 20, Medinah School District 11, Schaumburg School District 54 and Bloomingdale School District 13. Private schools in Roselle include St. Walter Catholic School, Trinity Lutheran and Medinah Baptist which are all elementary schools. There are many residents of Roselle who love and care about their community. Volunteers operate the Roselle Historical Museum, Sister City Alliance; community sports teams, scout troops, and mentoring programs. The yearly festivals of Roselle are also put together by volunteers. Lynfred Winery is one of the best in Illinois with a number of award-winning wines since 1979. The winery is a host of constant events as well as a great place for fine dining. Oktoberfest is very popular and brings in a crowd with “I Love Lucy” costume and grape stomping contest, grape seed spitting, wine tasting, great food and activities for everyone. Town Center is a great place to grab a coffee or bite to eat with friends or browse through local boutiques and shops. The Roselle Town Center is in the process of more development. In June the Rose Festival and Rose Parade are a big hit. The festival is full of live entertainment, food, carnival games and rides. Taste of Roselle highlights great eats in the area in an atmosphere buzzing with activity of live entertainment, bingo, carnival rides and a craft fair. The Taste of Roselle takes place in the middle of summer and all proceeds pay for improvements around Roselle. In July Roselle residents enjoy the free concert in the park series on Thursdays. Roselle is located just minutes from everything in the Chicago Metropolitan Area including the huge Woodfield Mall in Schaumburg and all the activities of downtown Chicago. There is always something to do in Roselle thanks to the Parks District. Every year the parks district puts on nearly 300 different community activities. The largest parks programs include sports, music, arts, dance, day camps, fitness, preschool, trips, and special events. There are 16 parks in Roselle with over 158 acres of land. Parks facilities include a recreation center, newly remodeled fitness center, free indoor walking track, renovated outdoor pool, sporting fields, splash pad, tennis courts, skate park, playgrounds, outdoor ice skating, and picnic areas. There is a great mix of home types and styles in Roselle to fit a variety of buyers. You can find condos on the top floors of mid-rise buildings downtown, town houses and single family houses. The most historic homes can be found near the center of Roselle in the form of 1870’s four squares. A little farther from the center of town you can find 1950’s and 1960’s production ranch homes and custom built prairie-style homes. The outer edges of Roselle offer post World War II subdivisions. The average listing price of homes in Roselle is $314,794. It is very easy to find a home in Roselle within walking distance of a train station to make commuting easy.